Just as I'm always looking for tablescape inspiration from magazines, blogs and designers, I'm also on the look out for centerpieces. 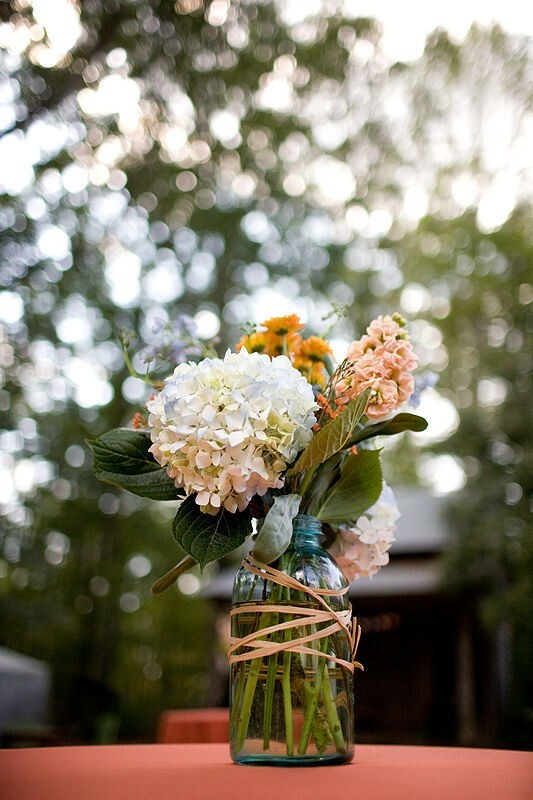 Here are some ideas from my file, plus a few of my own favorite creations, starting with this simple bouquet in a mason jar tied with twine. Simple and sweet. I like the country fresh style that jars lend, and how they don't dominate the table like an important arrangement in the center would. I've noticed they are becoming quite popular for wedding centerpieces. The trend is to march them down the center of the table. They're low enough, allowing for conversation. This is my version of the mason jar centerpiece. It's a huge jar wrapped in wicker and I love how it showcases the lilacs from my garden. 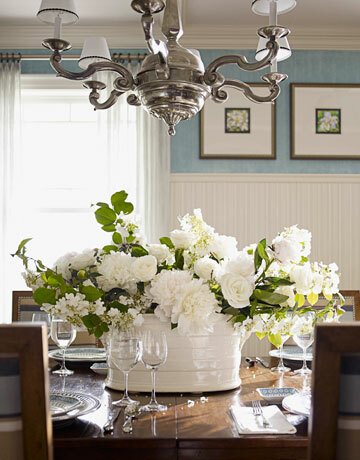 Let's look at some traditional centerpieces from my favorite designers. This elegant arrangement was created by Marshall Watson. My favorite. Massed roses and crystal. Of course, it is Ralph Lauren! Joe Nye used teacups for this centerpiece. They could be placed at each setting, or lined up down the center of the table. One of my favorite designers and tablescaper extraordinaire is Julio from Beaux Mondes Designs. I love how the flowers pick up the colors in the tablecloth. 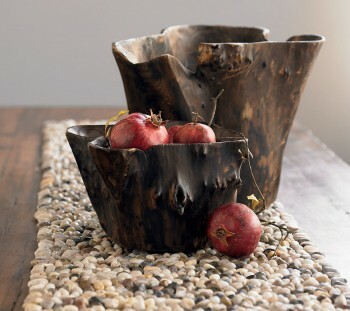 I created a similar arrangement last year for our gourmet club table centerpiece, using this shell encrusted compote. I gathered flowers from the garden which also pick up the colors in the runner. 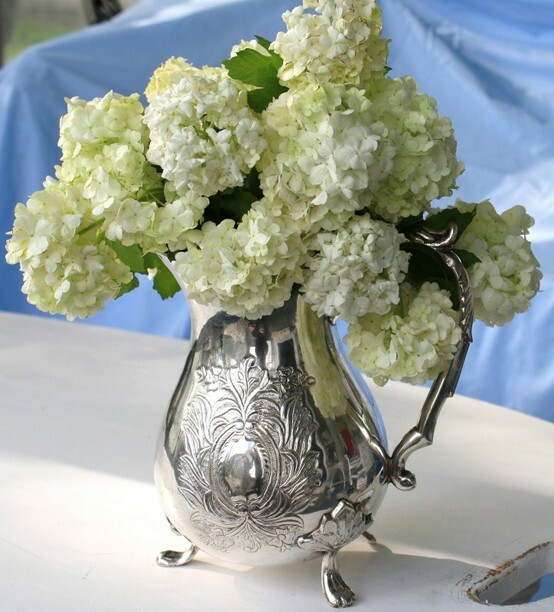 Here is an informal bouquet of white hydrangeas made formal with the use of a silver coffee pot container. This would also be a great centerpiece for a shower or wedding. Here is another cute idea for a shower or wedding centerpiece. 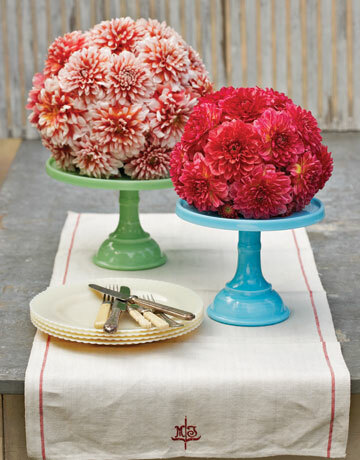 Flower spheres on cake stands. One of my favorites, I created this arrangement of roses in a wine bucket for Mr. A's wine club dinner last year. For another all male affair, I created this simple arrangement using another wine bucket. If you have been reading this blog for a while, it's no secret that I love rustic elements. 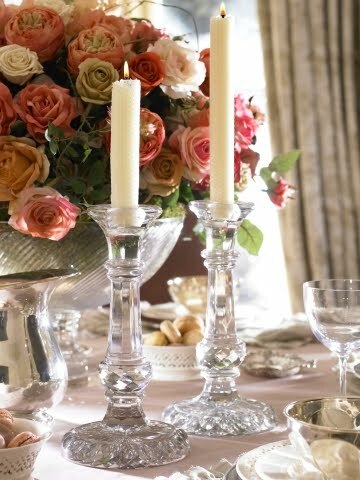 This simple arrangement speaks to me because I can imagine so many possibilities for the plates and linens. Perfect for an Autumn tablescape. Another Fall centerpiece idea. I love this so much, and plan on creating a similar arrangement for the afternoon tea I'm hosting in October. Last Fall, I created this centerpiece, using real and faux fruit, including grapes from our garden. 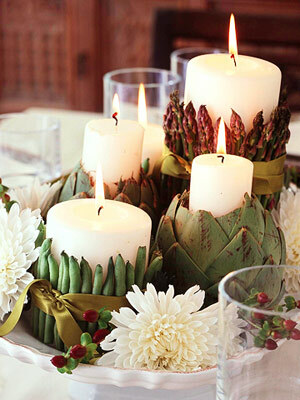 I've had this idea in my file for a while, and can't wait to try it for a Holiday tablescape. It says Winter to me! Another one of my creations! It doesn't need watering, so that's why it's perfect in Asti! It can be gussied up with flowers tucked here and there if need be. Last, but not least is my favorite centerpiece at the moment. A rustic metal flower box filled with succulents! I'm with Shelia, yours are my favorites.. I think I've used yours as many jumping off points.. Thanks for sharing so much beautiful inspiration with us.. These are all lovely! Flowers always make a room so cheerful! Expanding my cutting garden is a goal so that I have something for most of the year to put on my table. Think my invite for your afternoon tea got misplaced? LOL....OMG once again I LOVE LOVE LOVE yours more than "the pros". You are sooo talented and PLEASE tell me that backdrop in the picture of your table taken outdoors with the shell compote is fake! That is UNREAL. And if its real, I am rsvp'ing now for the tea in Oct! Fabulous!!!! Wonderful Inspiration photos! I love the fall inspired ones. Looking forward to seeing what you come up with for your afternoon tea. I love the candles with vegges around them. Great idea. I also love your fall centerpiece. Delores, Thanks for sharing your inspirational centerpiece photos.They're all gorgeous, but I have to say, I like yours best. I've been a huge Ralph Lauren fan for years, and also decorate with Autumn colors, so your centerpieces really speak to me. Thanks for the inspiration. 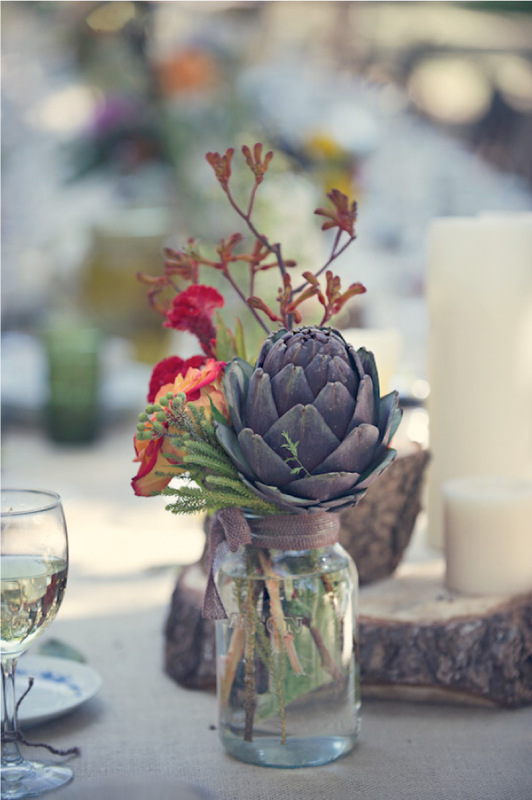 I love centerpieces and you've shown these at a perfect time... I'm in charge of centerpieces for our Silent Auction at work, so these have been a big inspiration to me. Thanks for the beautiful pictures! We love fresh flowers and can not get enough of them! We just got some fresh ideas for weekend arrangements for our guest! These are over the top and "yes" our favorite is the last one (simple yet make a statement)! Each one is beautiful, Delores. Thanks for the inspiration. 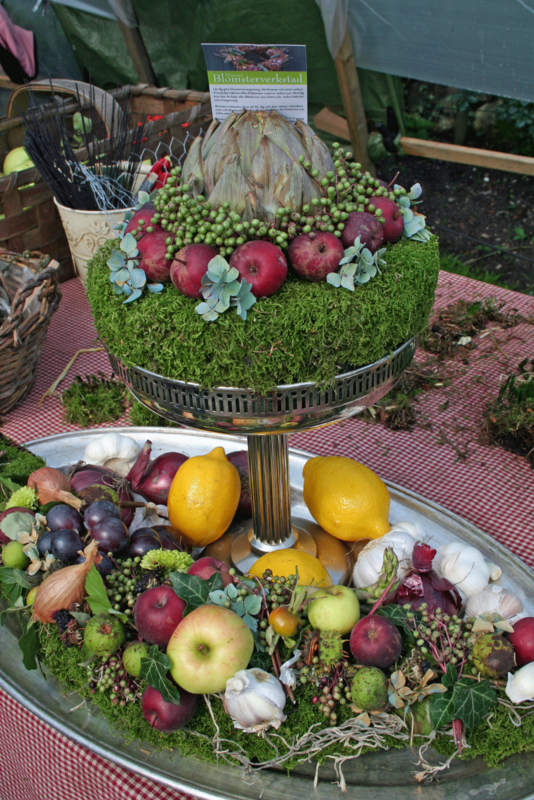 Your Abundance centerpiece is to die for. It looks like an abundant fall, but it also isn't stereotypically fall. They are all beautiful but I must say that I am always awestruck with the views you have there! I love them all, but especially yours with the shell compote and anything using artichokes. I wish I could grow some of the flowers used in SW Florida. I miss lilacs and peonies. This post is a keeper. Thanks. Absolutely gorgeous! I will come back to this post again and again for inspiration, Delores. Thank you! These centerpieces are all stunning! Your Ralph Lauren roses won over as a favorite!!! So romantic! However; I'll be hosting our Ladies Circle in November and your "Abundance" totally caught my eye. Thank you for sharing these lovely inspirations! They are all fabulous but that one you made last fall was spectacular! That's a wonderful idea using a tray to create such a rich and bountiful look! Love it! Love them all but have to agree with several others who commented that they liked yours best! 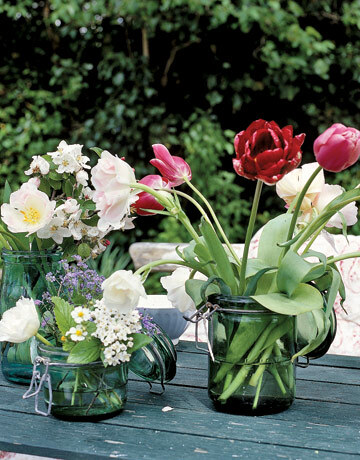 I love your selections of both flowers and vessels - all so casually chic and creative!! I am so flattered you used my photo of the silver pitcher and snowball blooms! As a small, beginning blogger, I could use the credit for my photos though. Oh, I love that last centrepiece! It's comparable to the ones from House Beautiful. I remember some of those - especially that first white bouquet - I remember loving and studying that room. 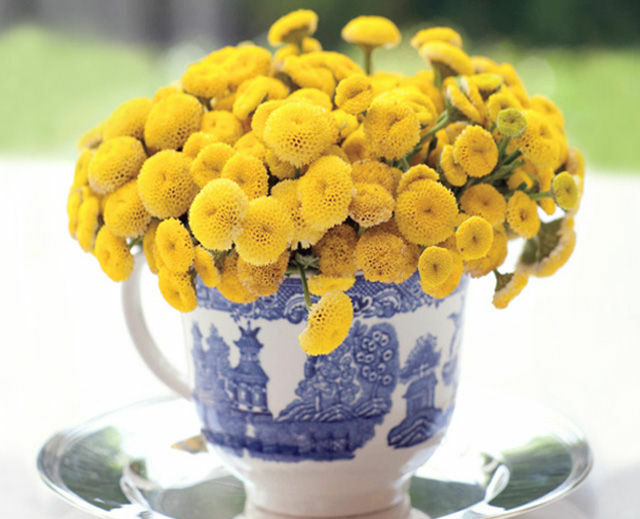 Also, how classic the blue teacup with the yellow flowers is - wow! oh, btw, do you remember.... I think that it was last year, the Pottery Barn catalog had the most beautiful ideas for centerpieces - acorns in jars, etc. Beautiful!